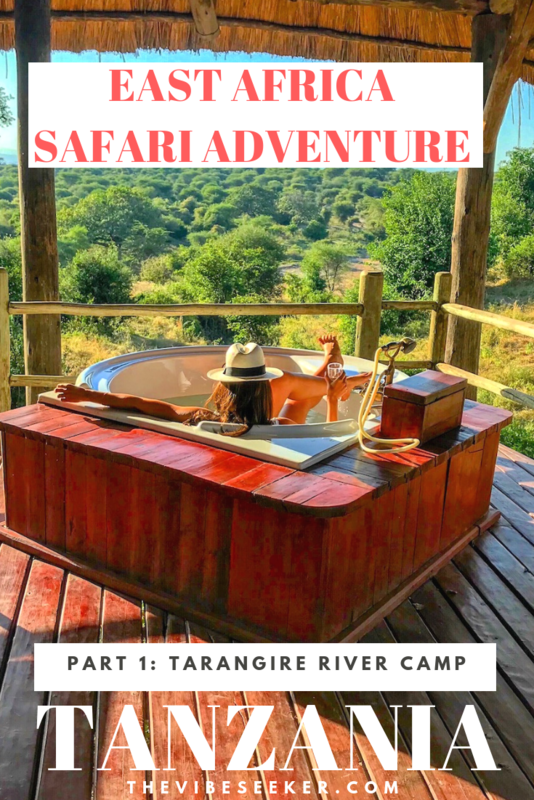 Our East African Safari adventure began with one night at Tarangire River Camp in Tarangire, Tanzania. After 8 hours of flights including a layover in Nairobi, Kenya, we landed in Arusha, Tanzania a bit bleary eyed and wondering if we were getting too old for short red eyes (I now firmly believe if you are doing red eyes and would like some descent rest, you need a full 10 hour flight). Nevertheless, excitement was brewing! We had just landed in arguably the safari capital of the world! Shortly after arriving, we hopped into a car with our guide (booked via intense research online. Our guide was AMAZING but I just can’t recommend the booking company because I find them unorganized and chaotic. Plus there are a million options out there so trust me you don’t need my suggestion), and headed off. 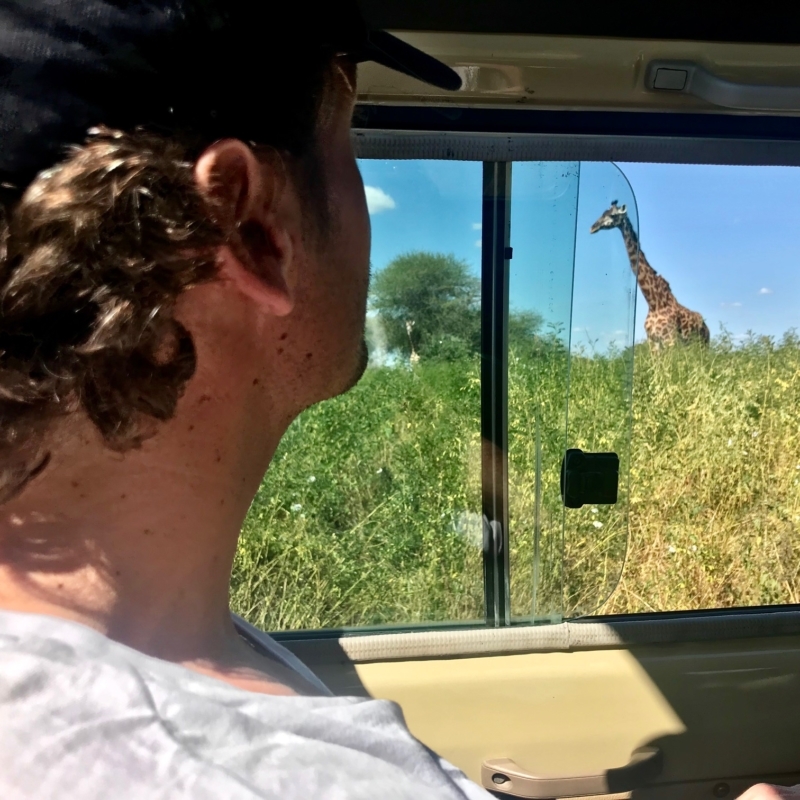 The drive from Arusha to Tarangire was 3-4 hours, mostly pleasant with glimpses of small villages, locals carrying traditional baskets on their heads filled with fresh vegetables and wearing bright, colorful fabrics wrapped as skirts. Silence filled the car as we peered out our windows in awe. It was like moving art. Living in Cape Town is not what most Americans would presume living in “Africa” might be like. Cape Town is aesthetically stunning, modern with paved roads, orderly traffic, and even has quite a few high-rises downtown. So, although we live in Africa, arriving in Tanzania was still a culture shock. Despite being in a large Land Rover, our ride was filled with lots of bumps, also affectionately known as the “African massage” as our guide taught us ;). Not sure if that’s my idea of getting the kinks out, but you know… TIA (short for “This is Africa”- please watch Blood Diamond if you did not understand this!! Leonardo DiCaprio alone is worth it.). As we entered the park, we saw for the first time zebras! You would think they’d be the least exciting animal, but we were shocked by their beauty! Their bodies are strong and elegant; their coats shiny and striking with bold black and white stripes. 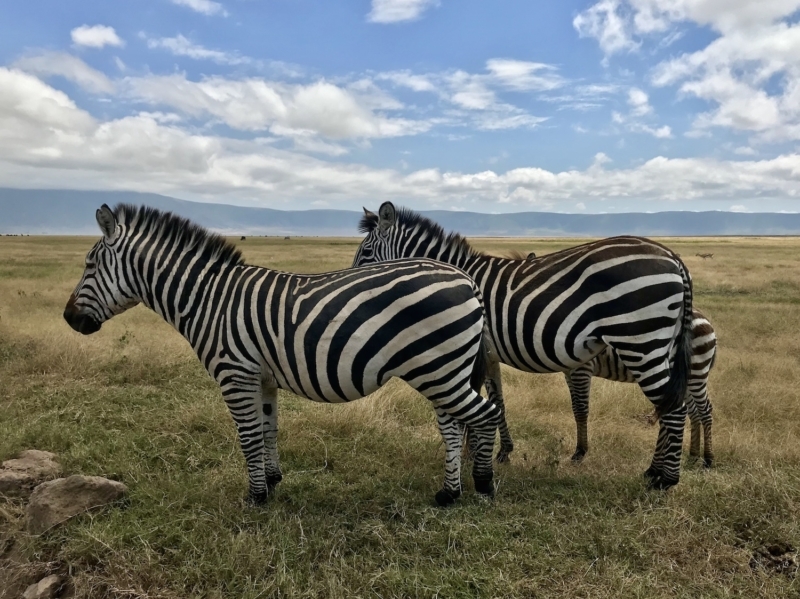 I think I assumed zebra print pillows and fabrics back home in the States were just the “fake” version of what Zebras must look like in real life… as in they can’t be thaaat beautiful. But, they’re incredible looking. 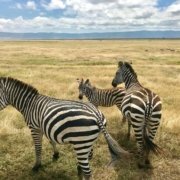 Look closer to see how the first zebra crosses her leg. So polite she is. Journeying on, sightings were sparse. 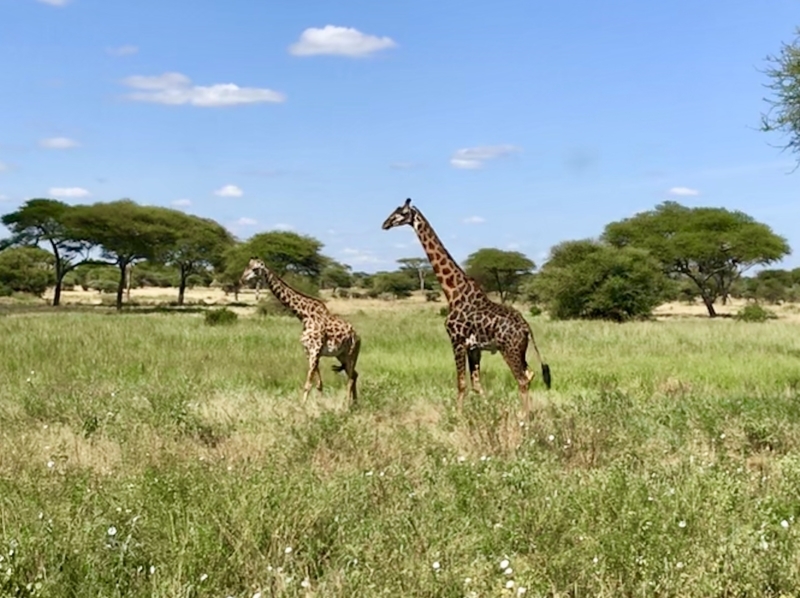 We saw 1 elephant, (poor thing was sick and laying down, most likely soon to take her last breath), ran into a few lovely giraffes, and met some cute baboons. Our highlight of the day appeared as we were leaving. We caught a lioness trying to take down a wildebeest who narrowly escaped with a bloody leg! It was sad and quite honestly a little disturbing for me, but it’s the circle of life. It did kinda feel cool like we were reporters for National Geographic (my husband’s dream job- I can’t get rid of those magazines all over my home). The great thing about safaris is that seeing the wildlife is just one part of it. Of course it’s why you go in the first place. To observe these incredible rare animals in their true habitat. It’s absolutely fascinating. But, there’s also something really special about coming back to your campsite/lodge/luxury tent after a day in the bush and being greeted by a campfire, a sundowner and zero wifi connection. It’s an experience that gets you feeling closer to nature, and forces you to be more mindful of the present. I am as guilty as the next person of spending too much time online. It can make me feel anxious, a little stressed and I find that I start comparing myself to others which is never good. That’s why experiences that truly disconnect you (literally) are so necessary today. It’s yet another reason why we’ve come to love it so much. 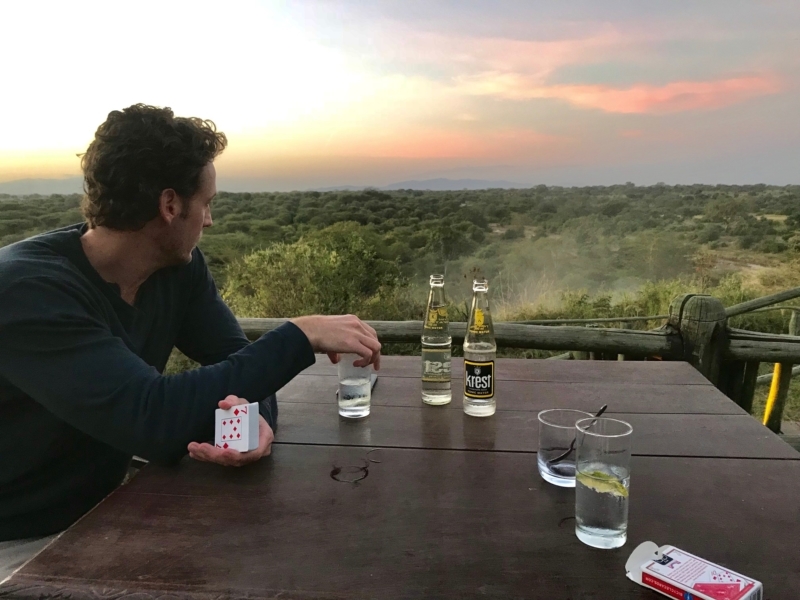 Settling back in Tarangire River Camp for gin and tonics and gin rummy. 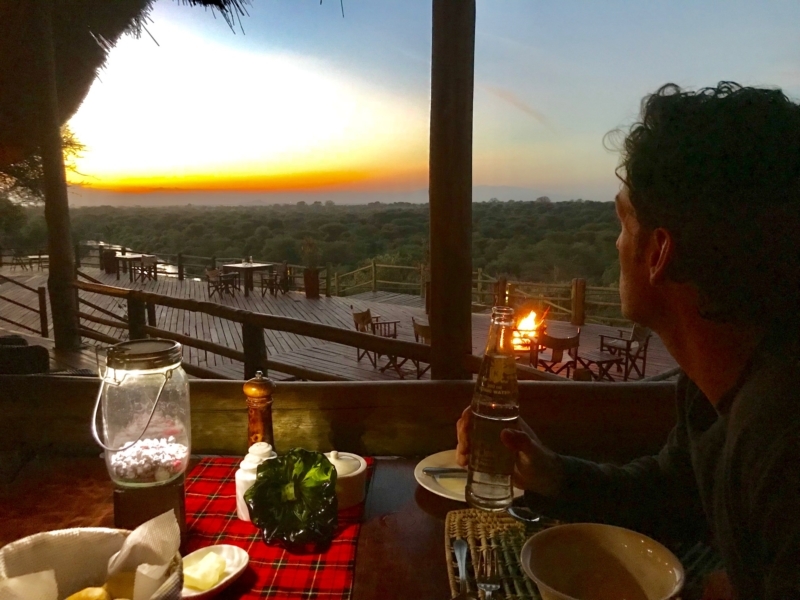 Sunset Dinner overlooking Tarangire National Park. Just breathtaking. As we enjoyed our wonderful meal, we met some fellow guests and chatted with the manager of the lodge. 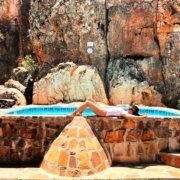 Turns out she is from Cape Town but has been traveling/living all over the world for the last several years. From Thailand, to India, to various parts of Africa…her stories were so inspiring. 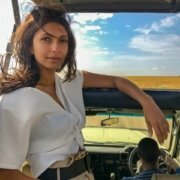 She works at lodges along the way and has saved enough to buy a modest home in a small rural beach town a few hours south of Cape Town. She wants to create her own bed and breakfast…dreamy… the best part of travel is always the people you meet. Morning after: see the water behind me? I saw giraffes drinking from it all morning. Tarangire River Camp was beautiful and rustic. 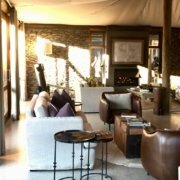 Well designed, great service, close to the national park gates, and so peaceful and serene feeling. 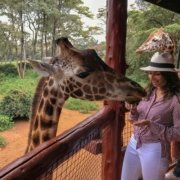 Looking back on this, it was such a lovely, easy first stop in Tanzania. Although our sightings were limited, Tarangire is known to have lots of Big 5 sightings and is a bit more cost affective than the Serengeti as well. 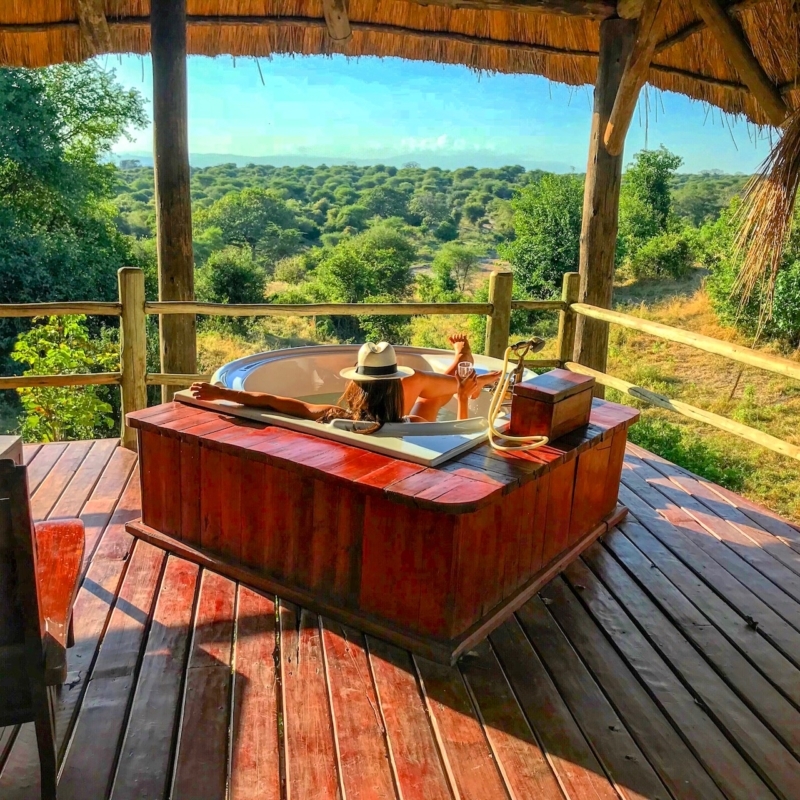 The safari experience is about being in nature, and nature can be unpredictable. That’s what makes each game drive so fun and exciting! You truly never know what you’re going to get. Who doesn’t like that?! Well, as long as a lion doesn’t eat me (for some reason, I have nightmares of that. I’m still not sure what that means…). 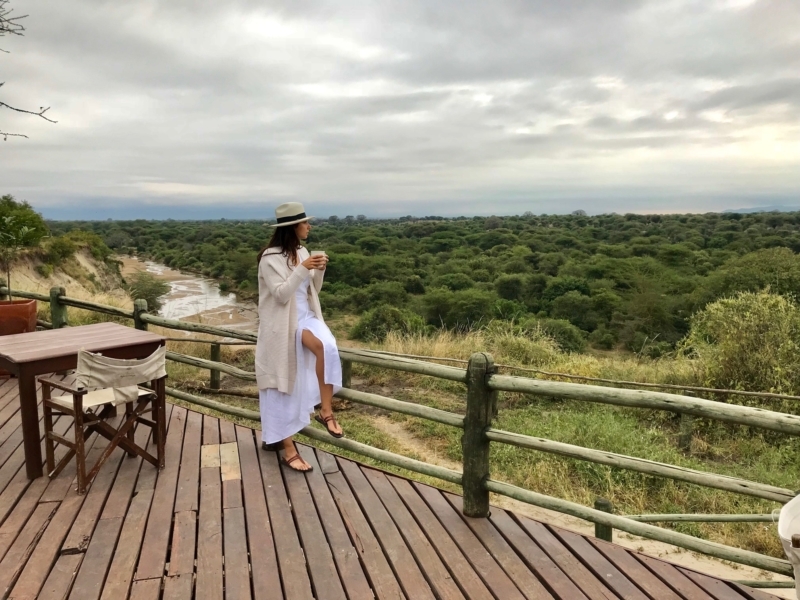 The next morning we enjoyed our coffees while we watched giraffes having their own morning drink at the river below our camp. It was so sweet! We then said our goodbyes and took off with our guide on our “African Massage” to our next stop! Ngorongoro Crater here we come!